Tis the season for a crumble, fa lalalala la la lala. Honestly, comfort food season is my absolute favourite. The second I feel a chill in the air, boom I’m in the kitchen grating a mountain of cheese and stewing fruit. For someone who lives to eat, there really is no better time of year. 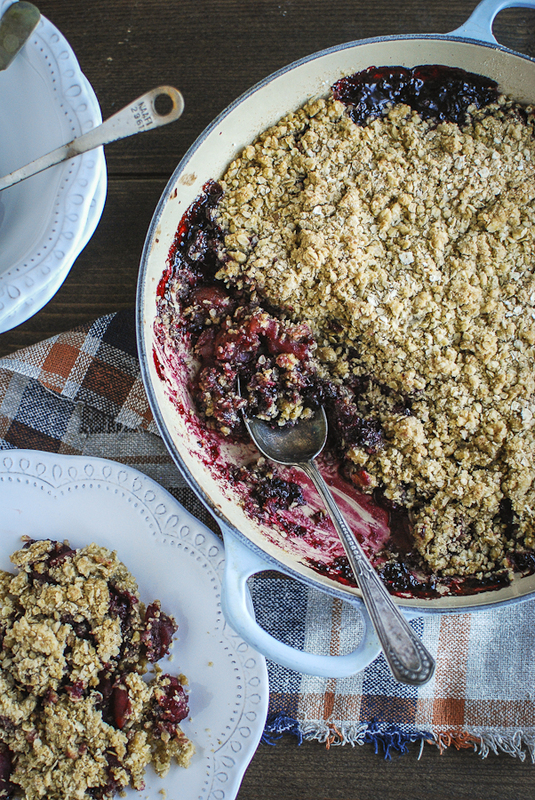 I find the best way to celebrate sweater weather is with a crumble, this apple and blackberry crumble to be exact. A few weeks ago I decided to take advantage of the tumbling blackberry bushes which align my walk to work and stock up on free berries. I filled a bag, washed my little beauties of bugs and dirt before freezing them for future use. They probably lasted around two days in the freezer before the urge to crumble them up took over. I grabbed a few apples from the fruit bowl and away I went. 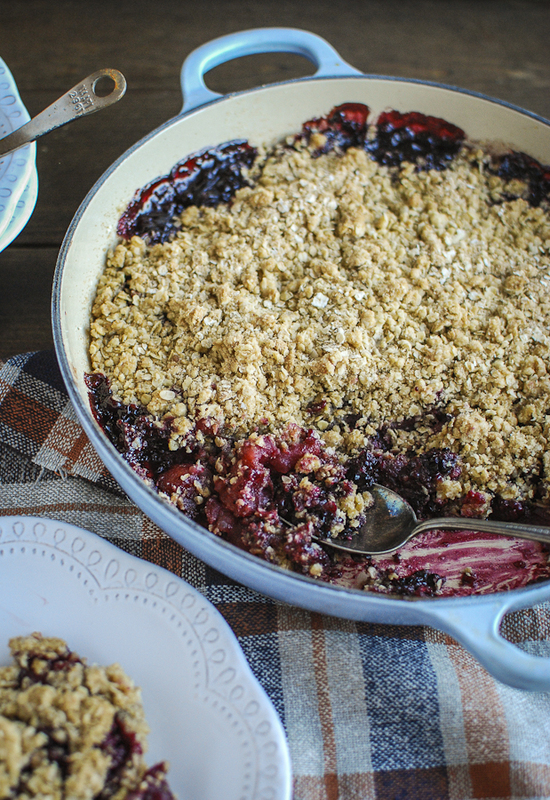 You can’t really go wrong with a crumble, so simple yet so delicious. Especially when served with a creamy vanilla custard. 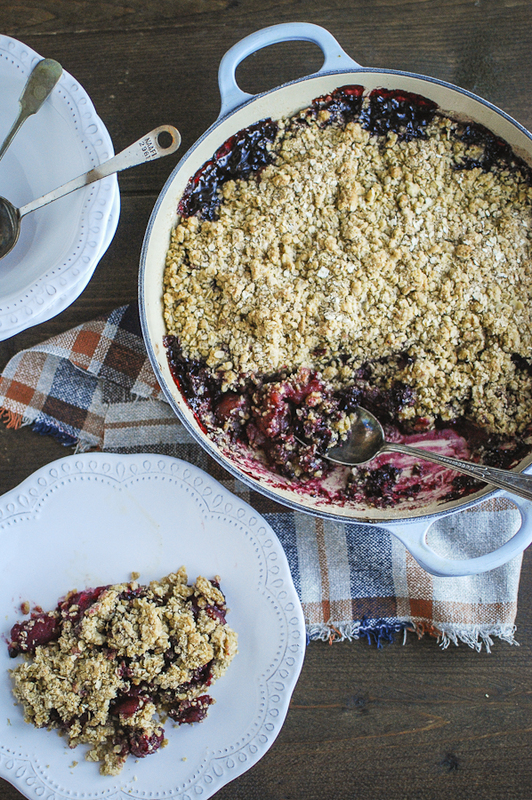 So, don your slippers, prepare a blanket covered space on the couch and get your crumble on. Autumn won’t know what hit it. Heat the oven to 170C and prepare a large ovenproof dish. In a medium saucepan melt the butter and sugar together. Add the apples and cook for 10 minutes until the apples become tender. Add the blackberries and cinnamon and cook for another 5 minutes. Transfer to the ovenproof dish, ensuring the mixture covers the bottom. While the apples are cooking, make your crumble. Put the flour, cinnamon and oats in a large mixing bowl and mix together. Add the cubed butter and lightly rub together, add the sugar and rub together again until combined. 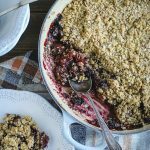 Sprinkle over the apple and blackberry mixture and bake for 20 minutes until the crumble is golden and the filling is bubbling. Serve with vanilla custard.